1. Brown ground beef with spices - drain. Add can of soup and can of corn, simmer for about 10 minutes. 2. In a greased 9x13 baking dish, arrange tator tots in single layer. Cover with 2 cups of cheese. 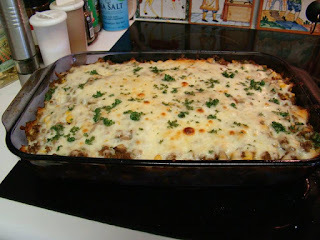 Pour ground beef mixture over top and cover with remaining cheese and 1 tbsp of parsley. 3. Place in a 350F oven for 30 minutes. Let stand for 5 minutes before serving.